You don't have to like sports to like beer, but you do have to like beer to like sports. And as we head into week eight of the NFL season, this is your gentle reminder that it's all but sacreligious to hit a football stadium without a cold one in hand. That being said, your standard 12-ounce brew will certainly cost you more than it should at a concessions stand (as opposed to your local grocery store), but hey, that's America! And watching the 49ers lose while you nurse a frosty Bud Light is what it's all about. If your local team is a tried and true let-down (hello, Jets), maybe it's time to rethink your affiliations. And what's a better predictor of good sportsmanship (and patriotism) than truly cheap beer? 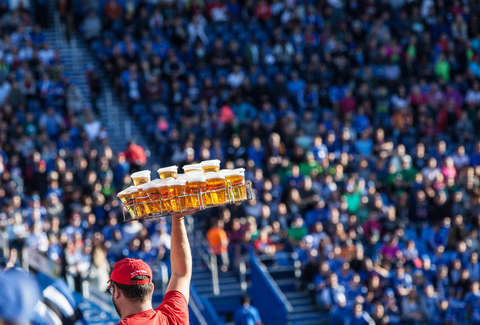 Team Marketing Report just released some research on stadium beer prices across the country, so you can see how your home team holds up -- or pursue some new allegiances. Apparently, the Raiders are slinging the most expensive brews in the country, with draught beer prices falling at a minimum of $10.75 for 20 ounces (technically it's not the priciest per ounce, it's just the biggest). On the other hand, plenty of teams (the Ravens, Texans, Falcons, Lions, Cardinals, and Bengals) will still serve a 12-ounce beer for $5, which is as cheap as it gets. Be a hero, root for the Bengals.